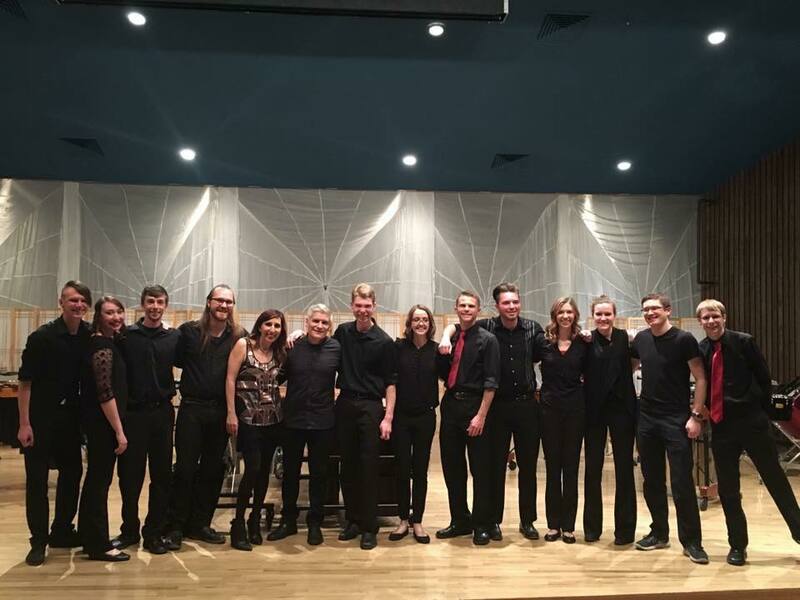 The Percussion Studio at Southern Utah University is a close-knit group of students pursuing both percussion performance and music education under the direction of Dr. Lynn Vartan. Students have the opportunity to study orchestral percussion, solo artist development, drum set, ethnic percussion and chamber music in the striking natural setting of the rocks and mountains that Southern Utah has to offer. Students also have the opportunity to pursue and design programs in education as well, such as the Elementary African Drum Group Bumbelberry Jam and ArtsFusion Elementary Percussion events at rural schools. The size of the Department allows for students to have constant access to Dr. Vartan, along with get-togethers like BBQ’s and a game night! There are also several opportunities to network with professional musicians who are frequently on campus to perform and/or record with Dr. Vartan. It is an atmosphere filled with performance, growth, sharing and fun! Southern Utah University invites you to come study percussion at the undergraduate level, and hone your skills to be successful wherever you decide to go next! For more info, contact Dr. Lynn Vartan at vartan@suu.edu . Thank you for your interest in percussion at Southern Utah University! Below are answers to some of the most frequently asked questions about the percussion program. Mallets: The selection should be chosen for musical content and technical difficulty (two-and-four-mallet work is desirable). Scales, arpeggios, and sight-reading may be required. Snare Drum: The selection should clearly demonstrate your level of technical ability. Rudiments, including an orchestra roll, at all dynamic levels may be required. Timpani: The selection should utilize two or more drums. Rolls with different dynamic levels on different drums should be demonstrated. Intonation and sight-reading abilities may be tested. 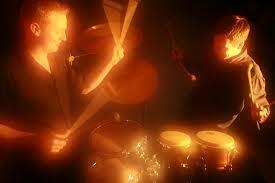 Drum set and/or ethnic percussion is not required but may be included at the applicant's discretion. Can I still audition if I can’t be there in person? Yes, you may submit video audition files to Dr. Vartan via email (vartan@suu.edu). Can I take private percussion lessons if I am not a music major? 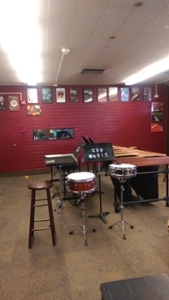 Yes, private instruction is available to students on a space available basis; preference is given to those students participating in large ensembles. 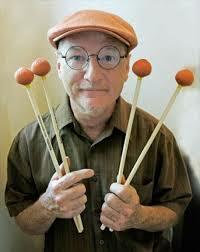 Percussionist Lynn Vartan is an international performer and educator who is an advocate for diversity in music. As a new music percussionist Lynn has worked with Michael Colgrass, Vinny Golia, Arthur Jarvinen, Ursula Oppens, Joan Tower, Glen Velez, Xtet, James Newton, Chinary Ung, the Hilliard Ensemble, the Tambuco Percussion Ensemble and Grammy Award-winning Southwest Chamber Music, and is known for her dynamic athleticism and exciting energy on stage. She has commissioned and/or performed countless new works for percussion by composers such as Donald Crockett, William Kraft, Steve Hoey, Veronika Krausas, Erica Muhl, Arthur Jarvinen, Sean Heim, Jeff Holmes, and Shaun Naidoo. As a recital soloist, Lynn has been featured on the Los Angeles Philharmonic Green Umbrella Series, the Different Trains Series, at Montana State University, Cornell University and with the USC Contemporary and Percussion Ensembles. She is regularly presented on the Music at the Court series in Pasadena, California, where she produces her own solo percussion concerts. As a concerto soloist Lynn has performed with the Sierra Wind Symphony, the CSUN Symphony and Southwest Chamber Music, as well as premiering two additional new concertos for marimba and percussion by Mark Lanz Weiser and Shaun Naidoo. As a recording artist, Lynn has appeared on the ECM New Series for Stephen Hartke's Tituli, and was twice Grammy nominated on the Cambria label with Southwest Chamber Music in the "Best Classical Album of the Year" and "Best Small Ensemble with or without a conductor” for The Complete Chamber Music of Charlos Chavez, Volume III. Lynn is also featured on Albany Records as a soloist on an album of music by Erica Muhl and she is currently producing two albums of her own for release next year. A devoted ensemble musician, Lynn is the percussionist for Southwest Chamber Music, the violin/percussion duo 61/4 which she founded with Shalini Vijayan, and a duo percussion group she formed with Tambuco's Miguel Gonzalez. She received her Master's and Doctorate degrees with special honors and recognition from the University of Southern California. Lynn is currently the Director of Percussion at Southern Utah University. Lynn is endorsed by the Paiste Corporation, Remo Inc. and Marimba One. MUSC 3240 - Percussion Ensemble, a half unit class welcoming less experienced players to develop skills and technique. MUSC 3241 - Advanced Percussion Ensemble, a two unit course for more advanced players featuring cutting-edge repertoire and multiple performance opportunities. MUSC 3242 - Drumline, a marching percussion ensemble that performs at campus athletic events and other venues. 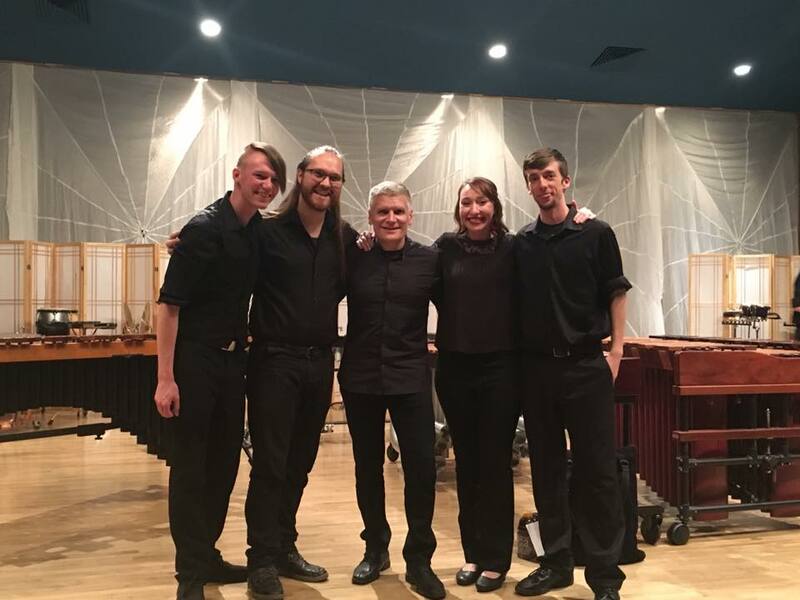 The Southern Utah University Percussion Ensembles perform historically significant works for percussion, contemporary percussion literature, novelty percussion and traditional non-western percussion music. The ensembles are comprised of both music majors and non-majors and welcomes students with a variety of levels of experience. Several performance opportunities are available to members of the Percussion Ensembles, including concerts, performances and other promotional events for the College of Performing and Visual Arts as well as concerts on and off campus. We are so excited to have grown to three full ensembles and have scheduled tours in 2012-2013 academic year. For a look and listen check out our YouTube channel. The SUU Drumline is comprised of both music majors and non-majors and welcomes students with a variety of levels of experience. During the Fall semester, the Drumline plays al all the home football games and usually travels to one or two away games to get the crowd energized for the team! 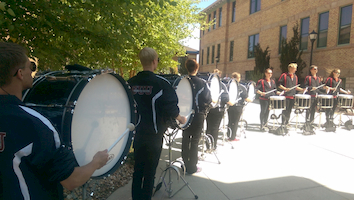 The Drumline also participates in the annual Homecoming parade, and for other events on campus such as our Science Building Dedication ceremony and the Bell Tower tradition of welcoming the new freshmen to SUU. In the Spring the drumline puts together a indoor show that performs at some home basketball games. Each year, the SUU Percussion studio hosts a Percussion Festival with workshops and concerts with various guest artists! 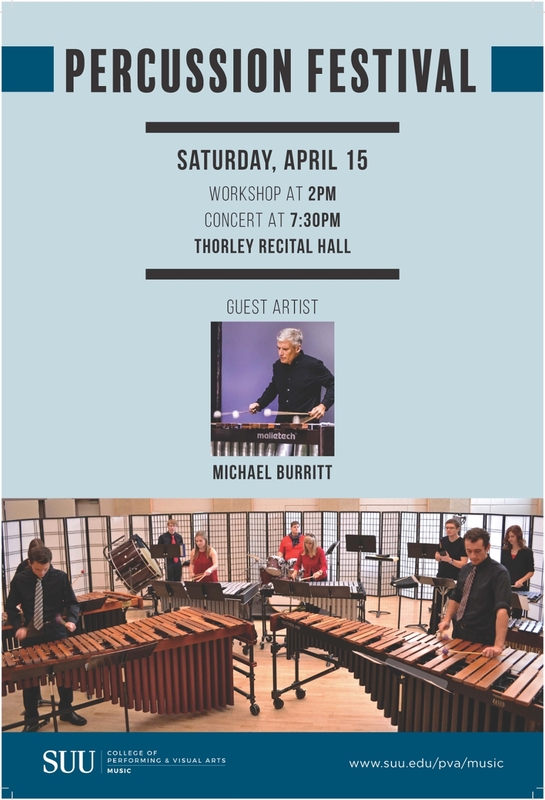 In April of 2017 we hosted Michael Burritt who performed with the students on his “Home Trilogy” and premiered his new duo with Dr Vartan! He also and gave a masterclass and lessons! Dr Vartan judged and performed in the Taiwan Percussion Association 2017 Summer Festival and then visited with Percussionists in Malaysia! Dr Vartan toured and performed with The World Percussion Group in England, Norway, Finland, and Estonia! SUU hosted the annual Percussion Festival with Micahell Burritt in residence! It was a week of tons of lessons, rehearsals and performances! Shanghai percussionist and Marimba One artist Wei Chen Lin visited SUU and gave a masterclass and lessons to the Percussionists. Guests Kathleen Roland and Nick Gianoplois cam to perform with Dr Vartan for the Satellite Salon event titled “Composition Conjuring,” featuring premieres of new works for voice and percussion. SUU's music department hosts the High School Honor Band Festival! Many high school students travel from far places to come participate in the event and get a taste of SUU music! Choir, Band, Orchestra, Jazz Band, and other small ensembles all collaborate for an amazing night filled of Christmas Music! Percussionists are everywhere and performing in many different ensembles! 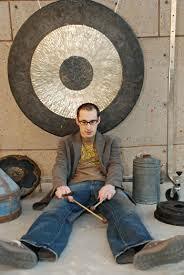 Alumnus Joe Howe received his Masters Degree in Percussion Performance from Southern Oregon University. Go Joe! The Percussion Ensembles play an amazing concert directed by Dr. Vartan! Some of the favorites pieces were Stool Pigeon, The Breath of a Tree, and Rocket Summer. SUU percussion squad travels to Indianapolis to attend this years PASIC events including clinics, workshops, and finding inspiration! Alumnus Darin Hunsinger performed at PASIC with the exclusive World Percussion Group, featuring percussionists from multiple countries. SUU Percussion hosted Patrick and Rachel Roulet for Satellite Salon featuring the "Golden Age of the Xylophone." Students enjoyed a concert an career talk with Patrick and Rachel. SUU Percussion hosted composer and percussionist Ron Coulter for a concert and masterclass on solo percussion music exploring sound! SUU T-birds won their homecoming game with an amazing defeat against Portland State! 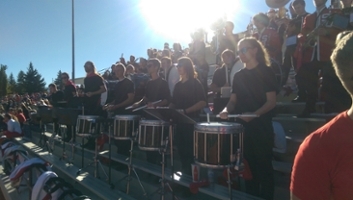 SUU Drumline members love attending our football games and being a part of the growing marching band! 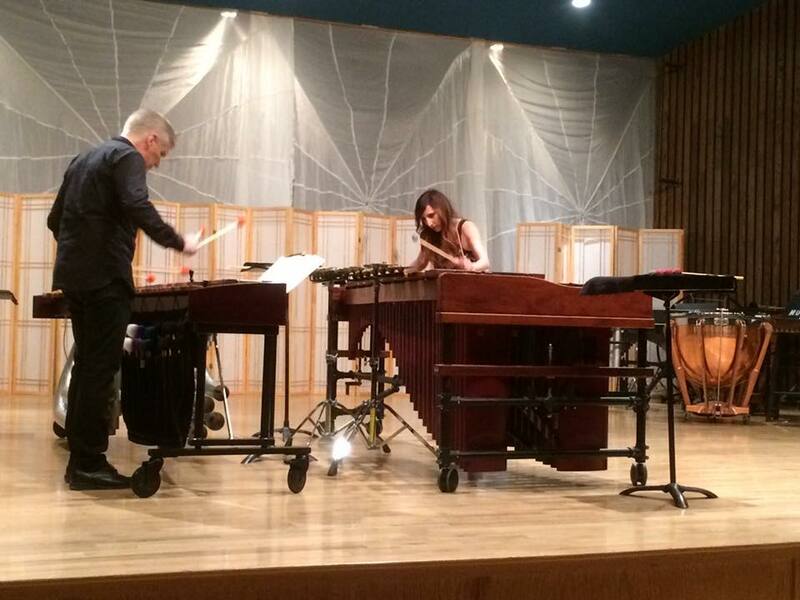 SUU hosted the Heartland Marimba festival with guest artists Michael Burritt, Clocks in Motion and Matthew Coley. Students from several states came to participate and take lessons, play chamber music and record great marimba music! Lydia Bradshaw graduated and was named the Outstanding Graduate of the College of Performing and Visual Arts! Go Lydia! 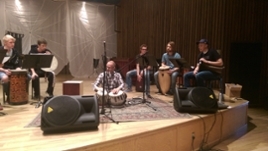 The SUU Percussion Ensemble was in the studio to record 2 of their Spring pieces for audio and video release. Stay tuned to see them on YouTube! SUU hosted its annual Percussion Festival with guests Brad Dutz and Chris Wabich. The students got to experience workshops on composition and world music and well as perform their Spring Percussion Ensemble concert for a full house! Tylor Williams and Teven Sherman played drums for the Theatre and Dance Department Production of RENT. Marissa Brown performed her Junior Recital which featured works with a world music emphasis. Pieces included Libertango, Chatterbox and an original composition for voice and pandeiro! SUU did great at the competitive events at the Utah Day of Percussion! Tylor Williams defended his title for 1st place in the Collegiate Marimba Category and Marissa Brown took 1st place in the Timpani category! SUU hosted the World Percussion Group for clinics and a concert. Percussionists from around the world are chosen to be a performing member of WPG to go on tour, including a former SUU student, Darin Hunsinger. 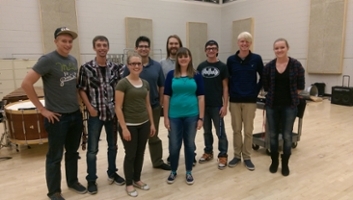 SUU hosted percussion professor Doug Smith from Utah Valley University. 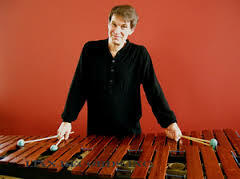 Doug Smith presented a unique program of works for marimba and voice. Dr. Lynn Vartan hosted Satellite Salon Series, “Power Play: An Electric Evening of Music,” a performance built around the works of electronic composer Jason Francesco Heath with violist Alma Fernandez, both from Los Angeles, CA. The SUU music department hosted the High School Honor Band Festival. Students were selected for the two day festival of rehearsals and activities culminating in a concert at the end of the second day at the beautiful Heritage Center Theater in Cedar City, Utah. Junior Tylor Williams gave his Junior Recital, performing Ogre Ballet by Casey Cagnelosi and 4 Basho Haiku by Jorge Vidales. Another great evening of music! The SUU Percussion Ensemble gave their Fall Percussion Ensemble concert to a full house in Thorley Recital Hall! Pieces that were performed included Into the Air by Ivan Trevino, Postludes for Bowed Vibraphone by Elliot Cole (played in the dark) and The Dreamers of Dreams by Nathan Daughtrey. Check out out our YouTube page for videos from that concert! The whole SUU Percussion studio went to Texas for PASIC 2015! We had a great time and saw so many amazing percussionists and groups perform. Alumnus Darin Hunsinger was also performing with TCU! Lydia Bradshaw gave her senior recital! She played so much great repertoire, including Anvil Chorus and Luminocity. 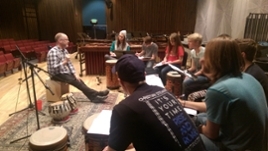 SUU hosted percussionist Kevin Bobo for an amazing masterclass and some special private lessons! He worked with us for 2 days and gave a great workshop on marimba and snare drum. The SUU Drumline was featured as part of the Orchestra of Southern Utah’s "Rhythm of the Drum" concert! The drumline opened the whole show with some cadences and then Dr. Lynn Vartan and Shane Summers played Third Rail for snare drum and electronics! We hosted our annual percussion festival with guest artist Terry Longshore from Southern Oregon University! It was an amazing weekend of learning about tabla and cajon! SUU Percussion Grads are going places! One of our grads Darin Hunsinger received and accepted a Graduate Assistantship at Texas Christian University! We are excited to see him perform with them at PASIC in November 2015! The SUU Percussion Studio went to Indianapolis, Indiana for the Percussive Arts Society International Convention! It was four days on workshops, concerts and all things percussion! We also got to take some photos with out favorite artists! Joseph Howe, class of 2013, was hired as an Adjunct Professor at SUU and is now teaching the SUU Drumline! Lydia Field, class of 2015, was hired as a staff accompanist at SUU! Marissa Brown, class of 2017, fulfilled a dream to go to Africa this past summer! Darin Hunsinger, Class of 2016, was awarded a Graduate Assistantship for his Master’s Degree at the University of New Mexico. Darin Hunsinger, Class of 2016, performed with the World Percussion Group Tour of 14 universities around the US in the Spring of 2016. Darin Hunsinger, Class of 2016, is performing a Showcase concert at PASIC 2016 with the World Percussion Group. Darin Hunsinger, Class of 2016, performed at PASIC 2015 with Texas Christian University where he was awarded a Graduate Assistantship in Percussion. Joe Howe, Class of 2013, finished his Master of Music Degree from Southern Oregon University. Joe Howe, Class of 2013, is performing with Left Edge Percussion Group, a quartet based out of Oregon. Joe Howe, Class of 2013, spent a month in Brazil in the summer of 2015 performing and researching Escola de Samba. Joe Howe, Class of 2013, was on the 2016 Board of Producers for the Oregon FRINGE festival and premiered his piece Illumination. Jamie Francisco, Class of 2008, received her Masters Degree from Portland State University.